Despite the critical hype surrounding Jeff Nichols' TAKE SHELTER, I just couldn't get into it. It was just so dour, and obscure and wilfully pessimistic that it alienated me. Nichols' sequel MUD is an entirely different beast, and worth every ounce of praise it's receiving. The movie drips with humanity and compassion. It speaks, as did BEASTS OF THE SOUTHERN WILD, to a vanishing of a lifestyle rooted in its environment and local community on the banks of the Mississippi. The stakes couldn't be higher. But to the movie's great credit, it's shot through with a disarming blunt humour delivered by one of its two superb child stars, Jacob Lofland. That helps to make us really care about the characters, and so to become susceptible to the thriller-like tension of the movie's final act. The plot is deceptively simple. Two charming kids, Ellis (Tye Sheridan) and Neckbone (Jacon Lofland) stumble upon an escaped convict called Mud (a grungy, grifty looking Matthew McConaughey). Ellis - from a mixture of plain decency and romance - decides to help Mud gather the materials to repair a boat and escape purely because he wants Mud to be reunited with his childhood sweetheart Juniper (Reese Witherspoon). The tension comes from the fact that Mud killed Juniper's abusive ex-boyfriend and his family is out looking for vengeance. Moreover, at an emotional level, we are deeply concerned as to whether the vulnerable skittish Juniper will have the courage to follow through with Mud. Indeed, a theme that flows through this movie could be summed up as "la donna e mobile". The movie is full of women who are flighty and let down their romantic with a capital R menfolk. The resulting film has a wistful, darkly comic tone. We feel the grittiness and the griminess of the locale as well as the stunning beauty of the river. The plot point that motivates the final act is heavily foreshadows and yet the betrayal that triggers it is so powerful that one can't help but get carried along with it. McConaughey continues his run of superb character roles, really getting shabby and battered for this one. And while Mud is charismatic enough to get these boys to help him, this is no Magic Mike style pure show-man. Mud is a far more layered, vulnerable and sometimes even pathetic character. Reese Witherspoon is good in a cameo role, but it's really the kids who carry the film and win our hearts. MUD has a running time of 130 minutes and is rated PG-13 in the USA. 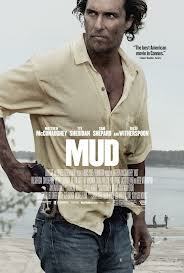 MUD played Cannes 2012 and Sundance 2013. It opens on France on May 1st and in the UK on May 10th.